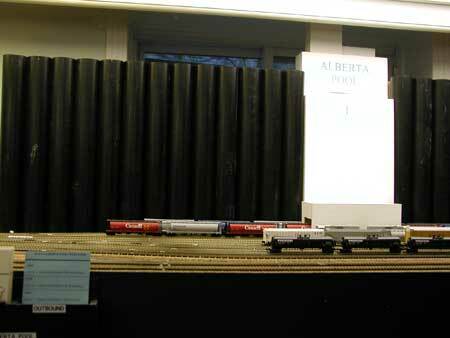 These Canadian model railroad photos were taken at the Canadian Railway Convention of the Canadian Association of Railway Modellers (CARM) that was held in Hamilton, Ontario May 16-18, 2008. 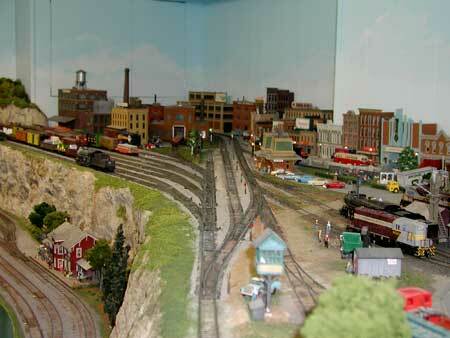 The Hamilton area is a hub of excellent model railroads. 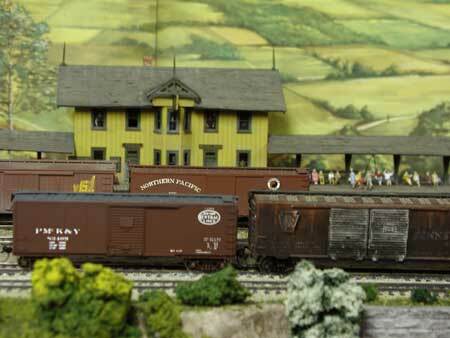 There were close to two dozen club and private railroads open to conventioneers. 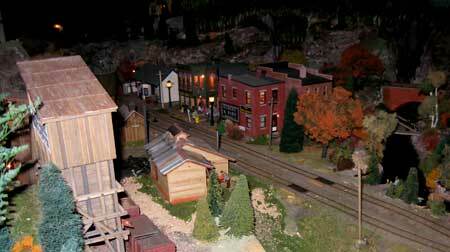 Scales and gauges included were N, HO, O, ON30 and G.
This is a small, representative sample of model railroad photos taken at the layouts. They are filled with good ideas and beautiful buildings and scenery work. 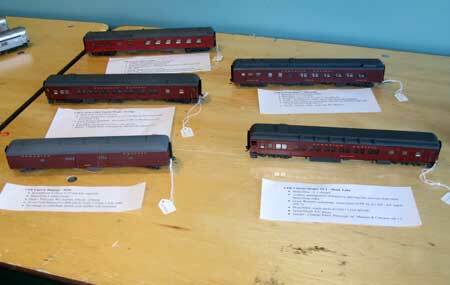 I did not keep notes of who owned which railroad although I do have the convention program. At the time I had no intention of starting this website. 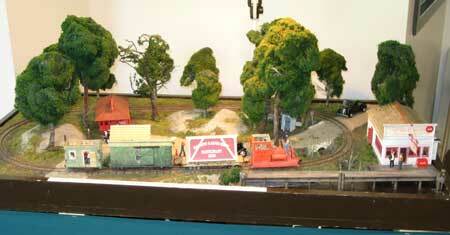 If you spot your layout or can help me identify them, please go to my Contact page and send me an email. 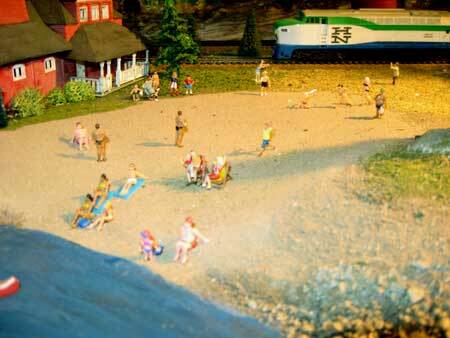 Clicking on the thumbnails of the model railroad photos will bring up a larger image. 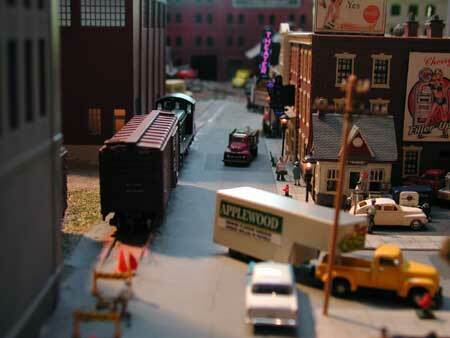 I hope you enjoy these model railroad photos from a few years ago. Many of these will have been updated but these photos will give you a good idea of what's out there to be seen. 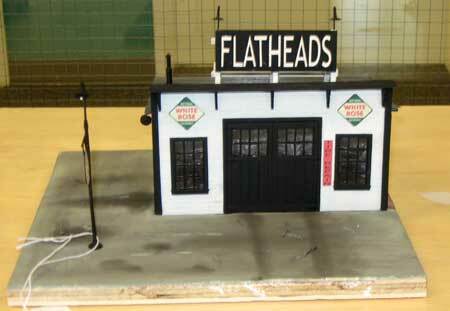 Wood paneled fascia and valence frame the railroad to give a nicely finished appearance to the modeled scene. 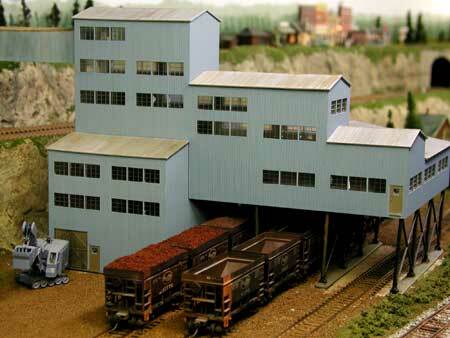 This scratchbuilt Stelco steel plant blast furnace is reminiscent of Hamilton, Ontario. 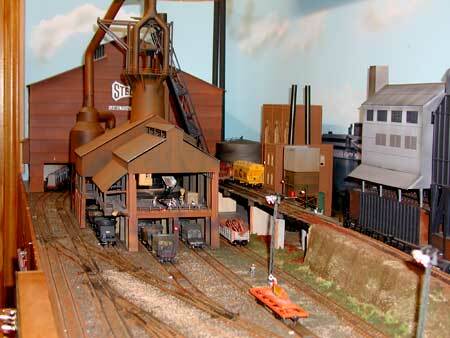 The steel plant complex dominates a section of the layout and provides a lot of operation. This heavy industry provides a use for several types of distinctive freight cars including molten slag cars and hoppers for scrap loads. The elevated yard is easily reached from the aisle and is backed by the cityscape. 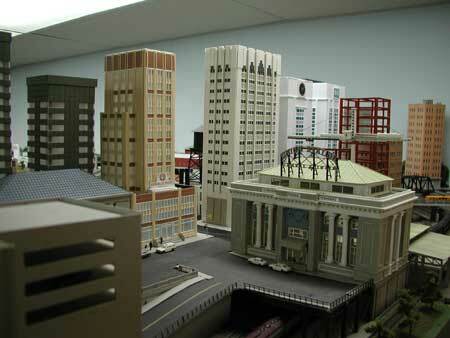 Many of the buildings are from popular kits. The bridges and shoreline help to disguise the curves that let the track bend back on itself Note the painted mountain backdrop. 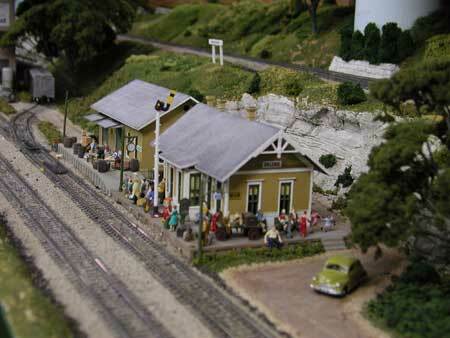 People bring a scene to life as shown here at Scotia Station. A train must be arriving shortly. Note the white marking by the Kadee magnet to show where to uncouple. Clever positioning of a mirror on the street in this "downtown" scene makes the city look much larger and more bustling. The angled roadway opens up the scene. The ship painted on the backdrop under the bridge closest to the wall adds depth to this busy harbor scene. 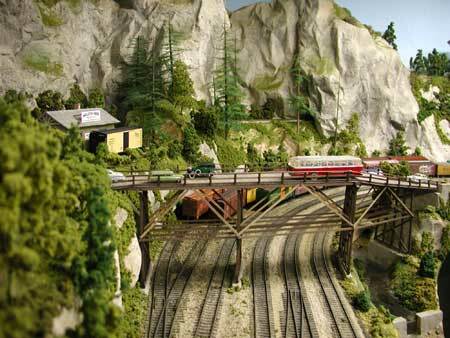 The road and mini-scenes in the foreground are complemented by a simple painted backdrop of trees and mountains to focus attention on the passing trains. 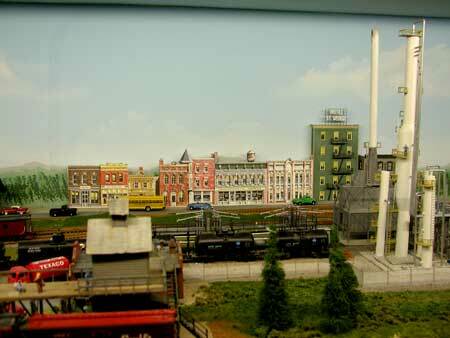 3D building flats in front of the painted backdrop use little space. The foreground is dominated by this oil refinery cracking tower. 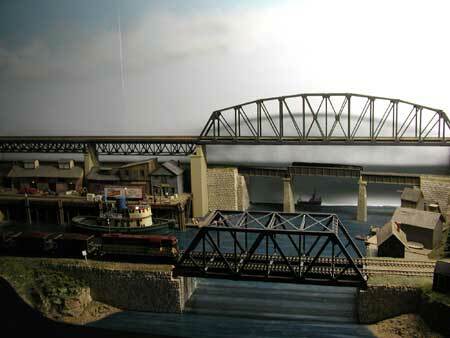 A trestle divides the scene naturally while serving as a method to carry elevated trackage around the layout. 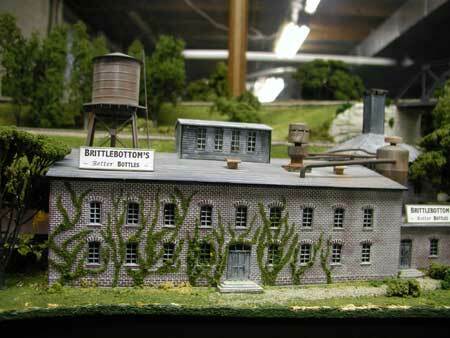 This appears to be the Walthers mine kit or a close approximation. It provides a lot of operation potential with only a few tracks and can be part of an "empties in, loads out" scheme. 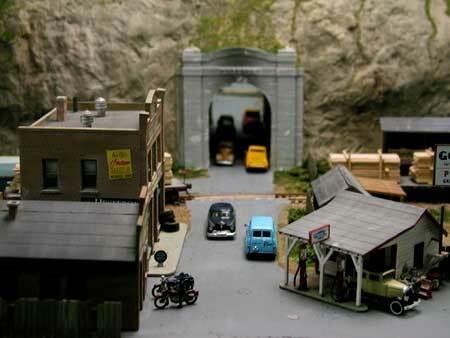 A mirror is used behind a tunnel portal to suggest that the street passes through the mountain. 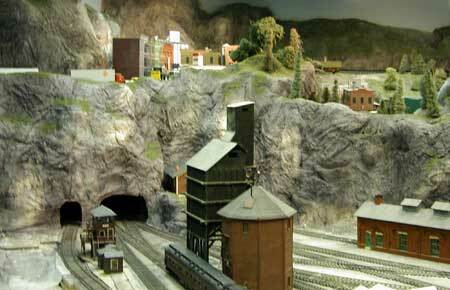 We often use tunnels for trains and forget about the cars! 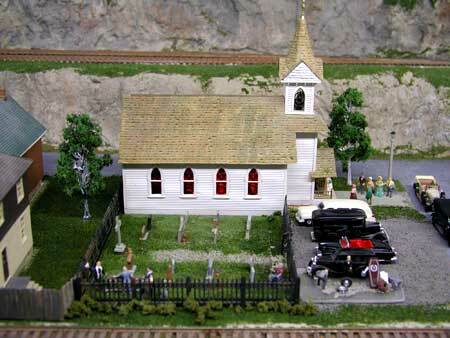 Mini scenes like this funeral at the church draw attention. Sound effects can be added to really bring life to the scene (pardon the pun). A freighter dockside and a crane keep operators busy while trains pass through the yard tracks in the background in front of the silos. 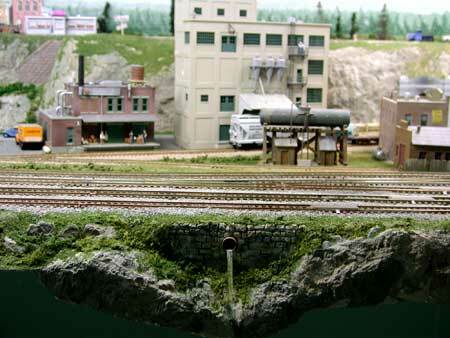 A simple, but very effective scene modeling a drainage pipe below track level. This is easy to do if you're using foam board. 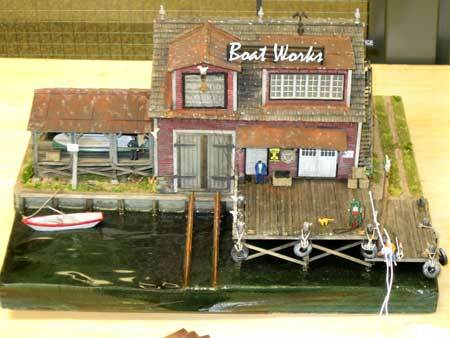 Notice the ship painted on the wall, the waves in the water and the buoy suggesting this is a salt water harbor. This scene predates the Canadian maple leaf flag because the Union Jack is still flying. Such touches can suggest an era. 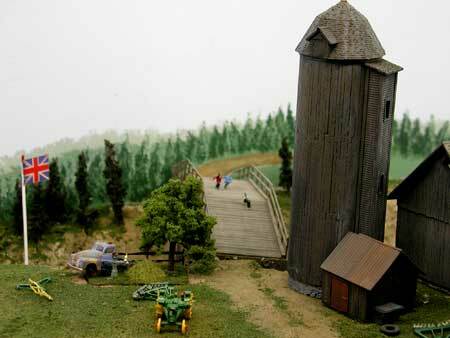 The farm silo and car bridge accentuate the period. The kids don't care about the passing trains. They've got a baseball game to finish. 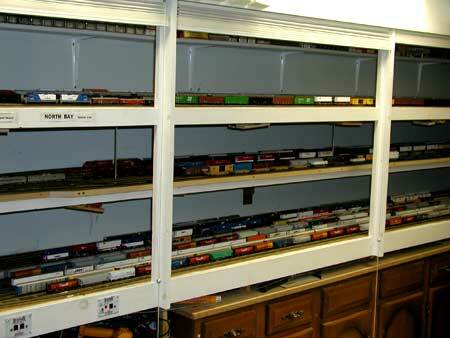 When you have a lot of freight cars you need a lot of storage for staging. 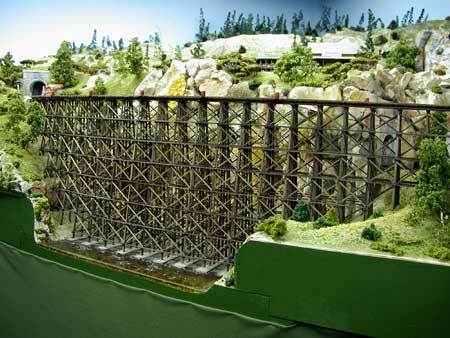 I believe this is Dave Tournay's N scale layout representing the Ontario Northland mainline between North Bay and Moosonee. 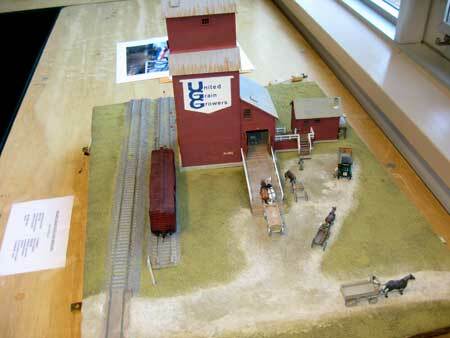 These cement silos dwarf the trains. 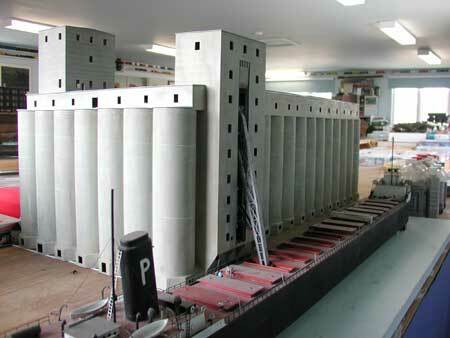 The silos are constructed from PVC pipe. 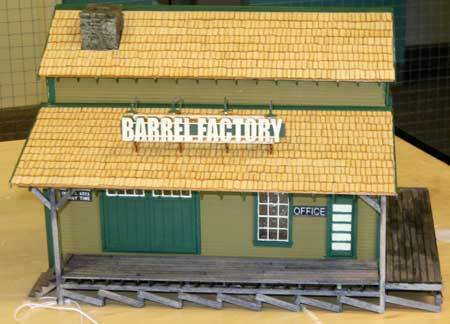 This is an inexpensive way of building a large industry that can also act as a scene divider. 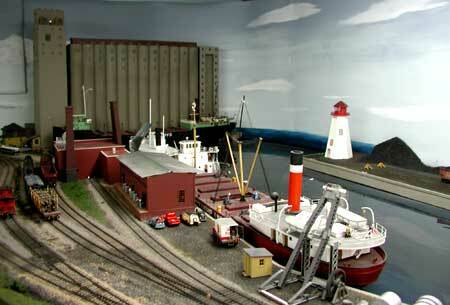 This gives you an idea of the overall effect of the PVC silos and the railway yard in front of them. Tasteful scenery without overcrowding effects suggests a less hurried period. 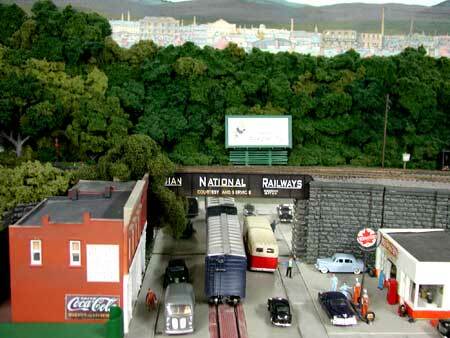 I think this is Godfrey Hall's HO scale Hamilton Northern set in the year 1955. Beautifully done. 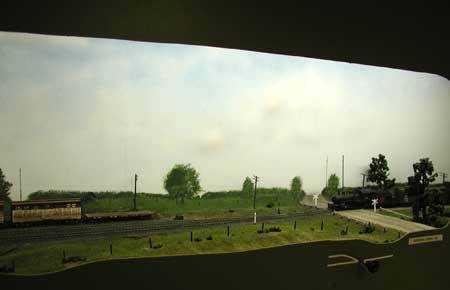 Acting as a "window box", the dark fascia and valence guide the eye into the scene so you concentrate on the train passing leisurely by. You can almost smell the coal smoke. Simplicity. A few painted trees and a modeled one. Hazy, cloudy sky. Several cattle cars waiting at the cattle pen for pickup. 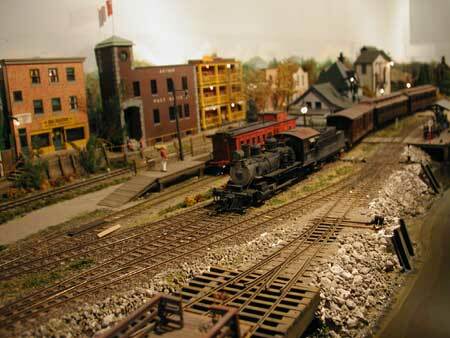 Scenes from Richard Chrysler's HO scale CNR Hagersville Sub set in June, 1950. A lovely river scene with two bridge styles and a painted backdrop of trees and hazy sky. The road appears to recede into the distance. The compression and use of the horizon's disappearing point are put to excellent use. Note the spacing on the painted telephone poles. 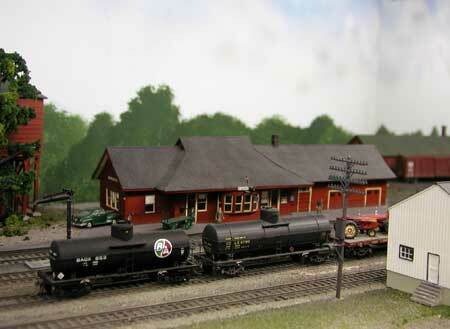 Several tank cars are parked in front of the station. The "B/A" decal helps to pinpoint this as an earlier era. A narrow shelf, framing fascia and valence, and the use of 3D building flats against a painted backdrop make this a superbly modeled scene. 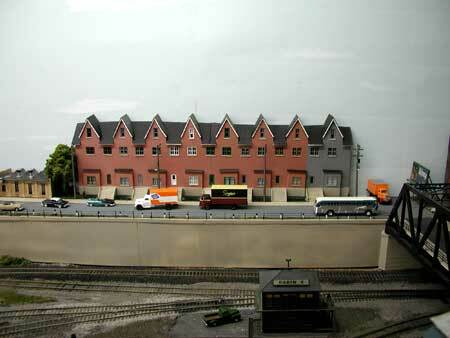 Here's another view of the narrow shelf with the 3D building flats and buildings painted directly on the backdrop. This is a big scene of a cement carrier freighter and large silos reminiscent of Great Lakes ports such as Collingwood and Owen Sound. Another big building, this one a factory. Only 4 floors but a large footprint. Lots of windows to paint! The cows have broken through the fence! 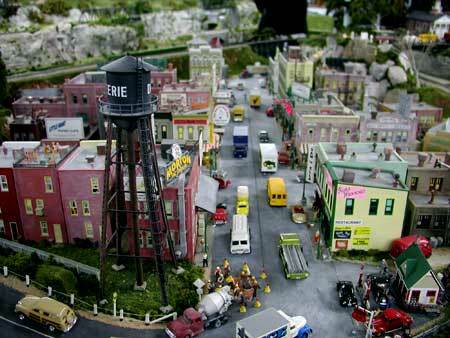 Mini scenes like this are a great attention getter. Note the painted backdrop. Ships are a good destination for lots of freight cars. Notice the lighthouse on the far side of the canal. 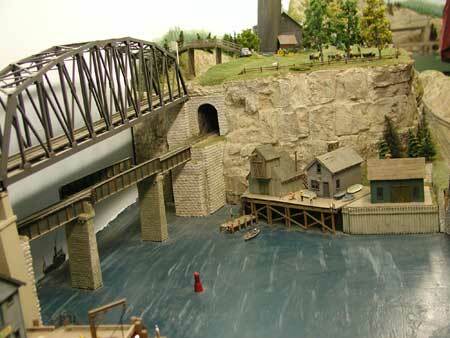 The back edge of the canal separates the scene from the backdrop. 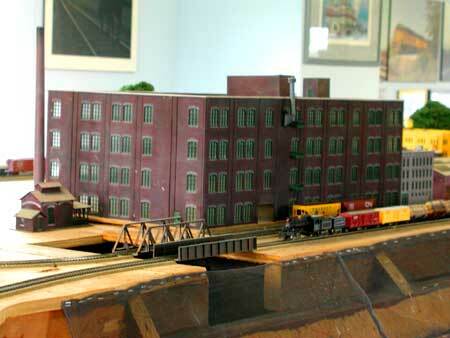 This factory is tucked into a corner as the tracks curve in front. The weathering effect, water tower on roof and the sign frame add character. Another factory is painted on the wall. 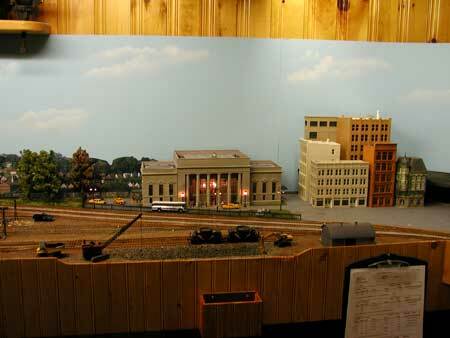 A wall separates the foreground tracks from the elevated street and building cutouts in the background. 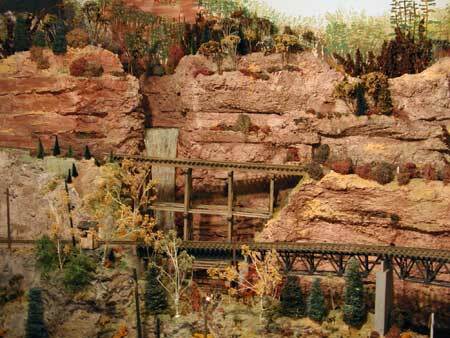 Stratified rock covered with bushes forms an embankment to separate the view of the upper level town from the lower tracks on the HO scale Spring Creek Valley RR. 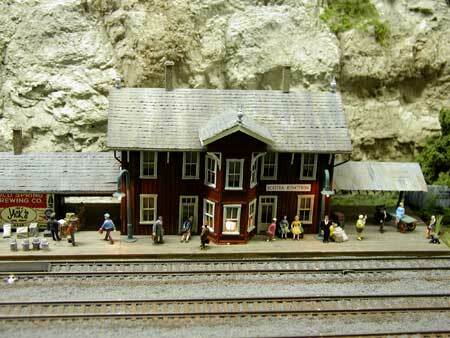 This attractive station backed by a treed hillside is a real eye-catcher. 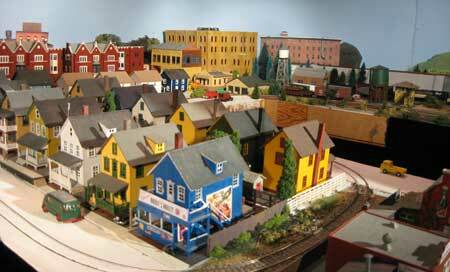 This model railroad was built by Jim Ellis and is set in 1950-57. Track is handlaid. The mirror trick here effectively suggests the automobile traffic passes under the railway bridge and continues on the far side. 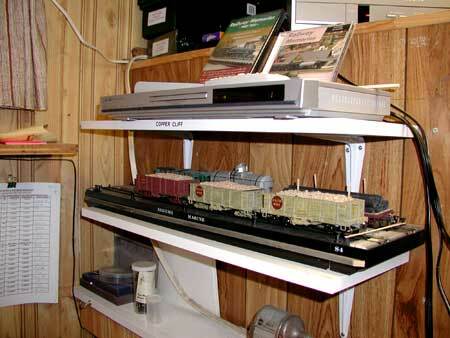 This full view shows how skirting provides a more finished appearance to the layout while hiding a myriad of things we model railroaders always need to store somewhere. Everyone loves a locomotive servicing terminal. This is a terrific one. Note the wonderful sky backdrop. A humorous sign draws a smile. "Bad water, bar open." 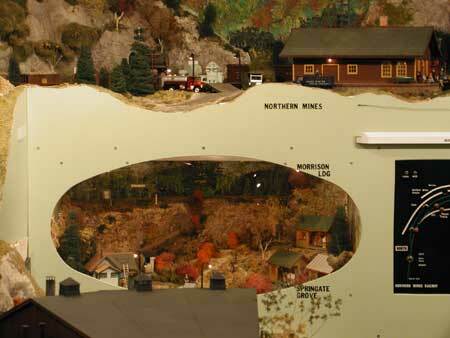 A judicious use of humor is sure to please visitors to your layout. Not everyone has room for large buildings. 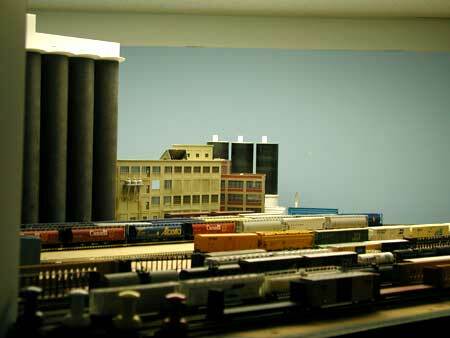 These imposing skyscrapers both serve as dividers and make the layout appear more real This 12X17 N scale layout is set in the 1950-1980 period and features Canadian Pacific motive power. The engineers blasted their way through this solid rock and didn't even need to put in tunnel portals. 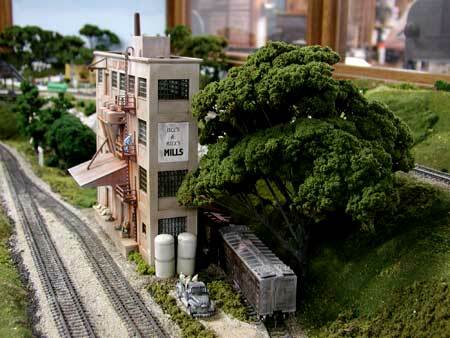 This N scale layout is the work of David (Bus) Haverson. 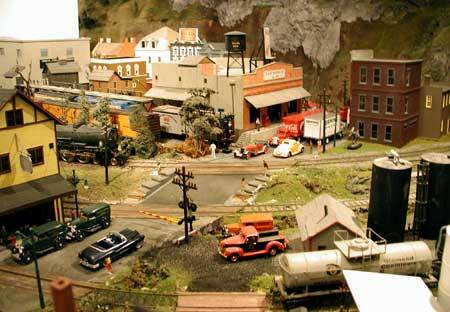 This was a relatively small layout just bursting with memorable scenes, like this street crossing the tracks. You want to linger and study this seacoast scene with its prominent lighthouse. The muted background is very effective. 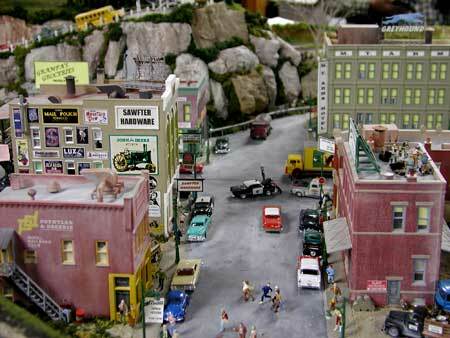 A city scene with track buried in the street can be very appealing. 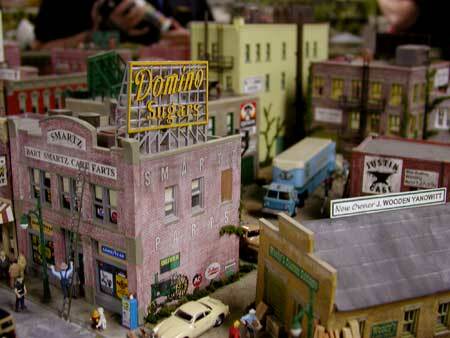 Here is a very creative treatment of a street scene. Another view of the same city. 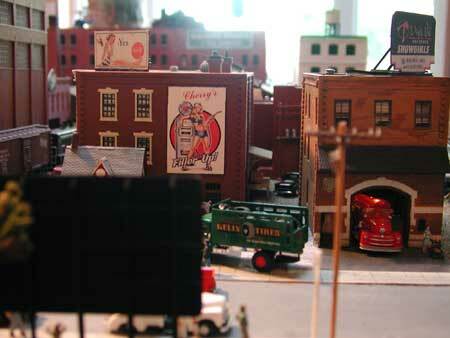 The signs on the sides of the buildings make the scene come alive as do all the small details. A fence provides definition. The track passes through the building. 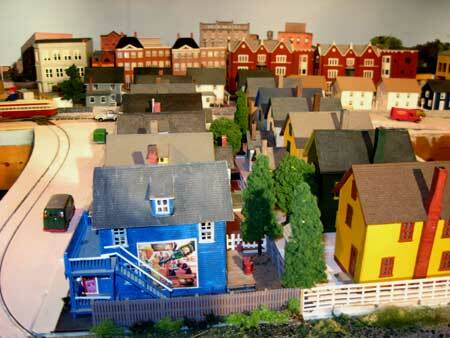 This is a great way to divide up a small layout to keep scenes separated. 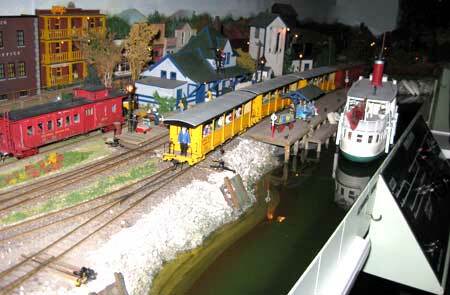 This model railroad is almost completely scenicked and runs beautifully. It is loaded with humorous signs and creative mini-scenes. 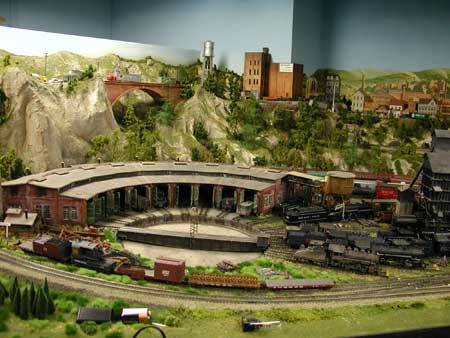 A large roundhouse, lots of locomotives, all kinds of action. 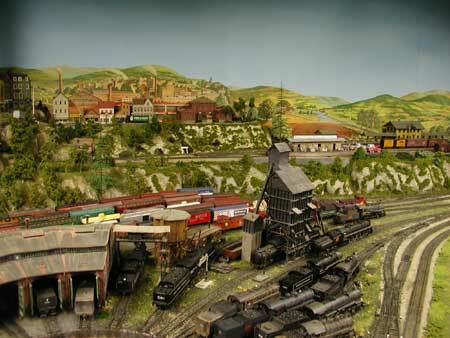 Just a fantastic layout to visit on the CARM tour. 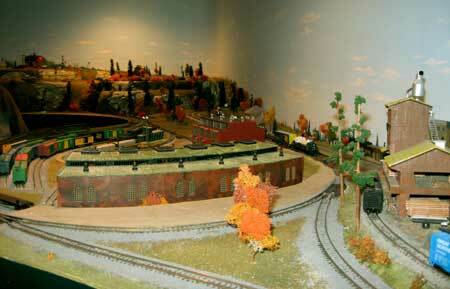 Another view of the roundhouse and railyard trackage. 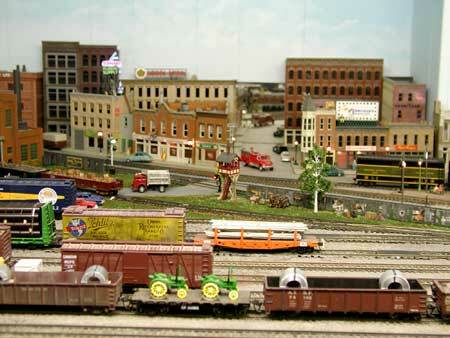 The background scenery provides a reason why the track is laid out the way it is. 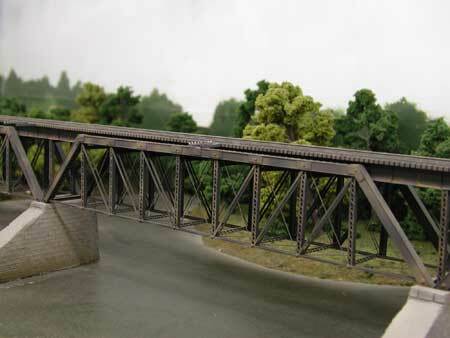 Including a wooden road overpass makes a dramatic scene and helps to frame the mainline tracks and the sidings beneath. 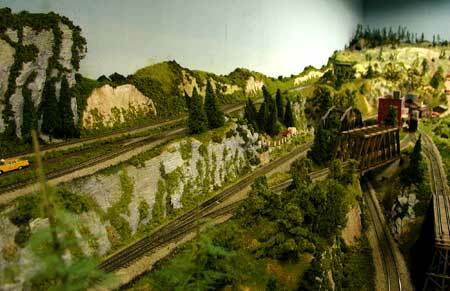 The mountainside scenery allows tracks to rise on three levels. 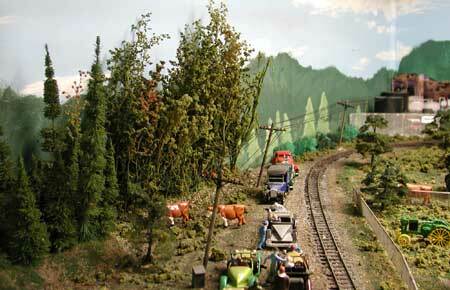 Avoiding parallel tracks and placing lots of trees helps to keep scenes apart. Vines cling to the side of this stone factory. This simple touch turns this building into a masterpiece. Building with stone is a nice variation from the usual brick walls that many of our structures are built with, at least in the northeastern parts of the U.S. and Canada. 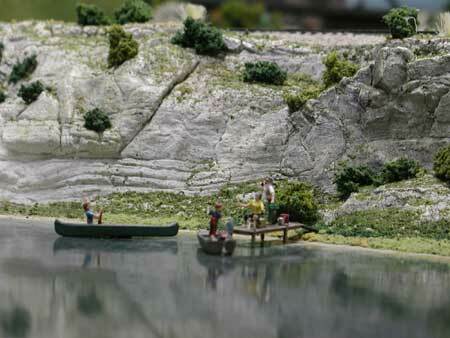 This simple detail of boys fishing makes this water scene come alive. It's these little added touches that set great layouts apart from the run of the mill. Commercial backdrops like this one of fields can work well. To see more useful techniques, go to backdrops This is the other side of the stone factory seen above. The sign says "If its a good piano, it's a Wonder!" 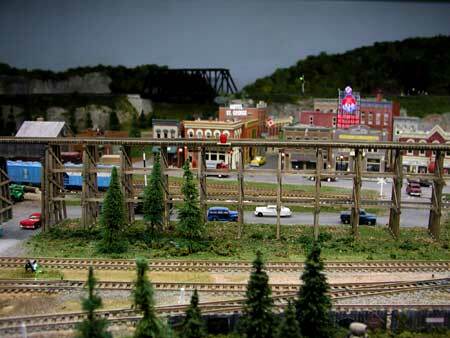 What's a model railroad without at least one trestle! Here's a beauty. The cliff work and waterfall behind are also impressive. Looks like a traffic accident is attracting curiosity. This is the type of scene that can be animated with flashing lights to good effect. It's always fun to see how someone else treated a well-known kit. 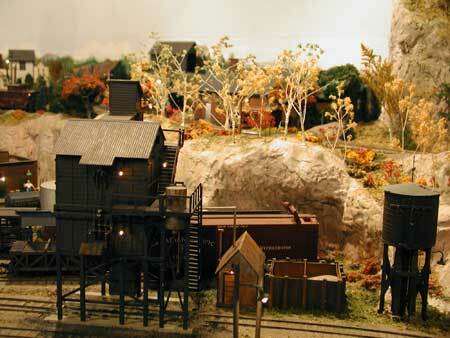 I also have this DPM Coal River depot on the Utopia Northern RR. 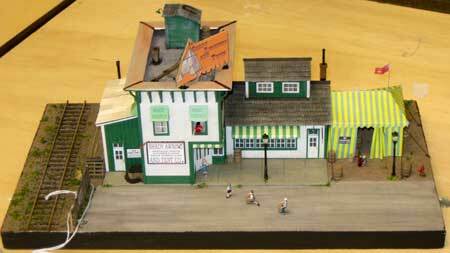 I also have this Walthers low-relief building except I cut mine on an angle and use it against a backdrop as Robin Hood Flour. 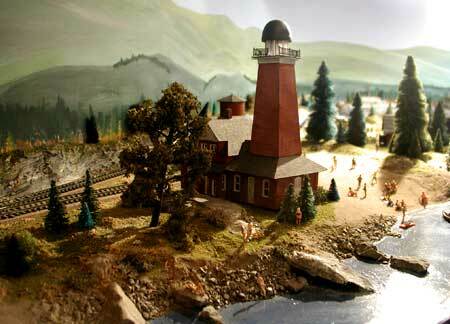 Mini scenes are always captivating. You never see all the action in just one layout visit. Are these guys on the dock working or just goofing off! "Wodden you know it" the new owner would be! Lots of funny signs in this town to make you giggle. 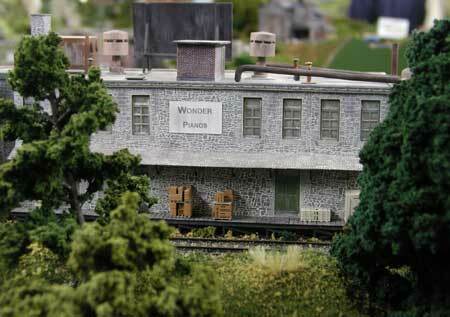 A very creative model railroader with a great sense of humour. 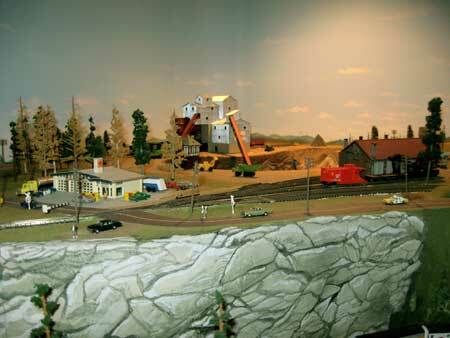 This fantastic ON30 railroad featured a barge scene where the barge can actually be lifted out and moved to a shelf for operations. Push pins and rubber bands keep the cars from rolling off while in transit. 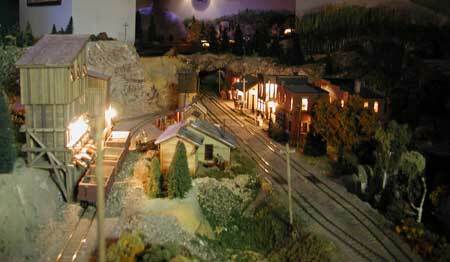 This railroad had marvelous lighting effects as can be seen in this night scene of the town. Here's the same town with the house lights back up. Night becomes day again. 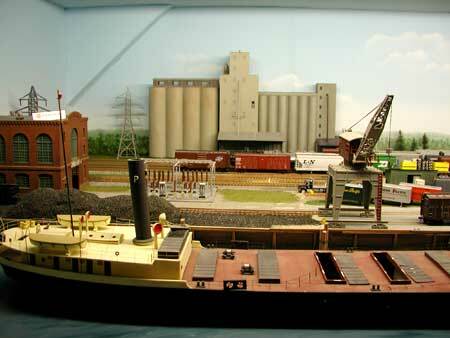 The barge on the shelf (above) is now connected to the barge apron so trains can pick up the freight cars. 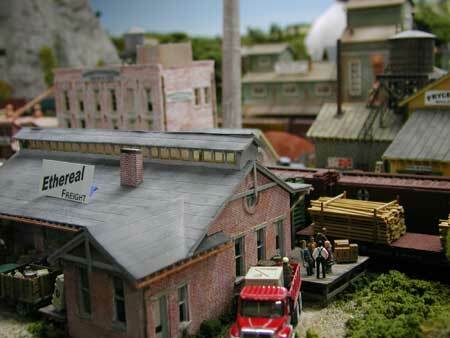 A miniature scene handled as a window box treatment. 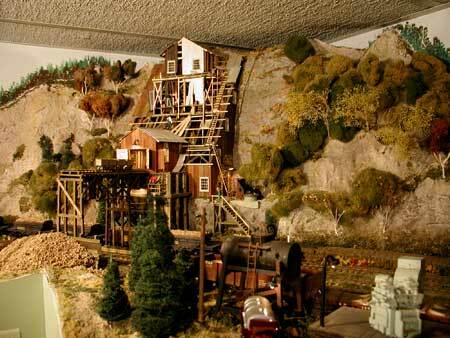 This is a very novel way of creating a diorama within a model railroad. 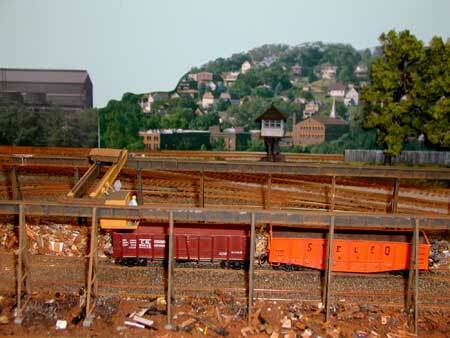 The view from the barge apron track looking towards the town and small railyard. This is a pleasing scene that has all the elements of great scenery from backdrop to foreground treatment of rails and buildings. 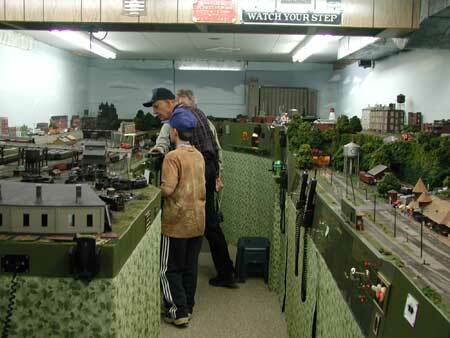 Another view of the same general area that provides a good view of the hand-painted backdrop. 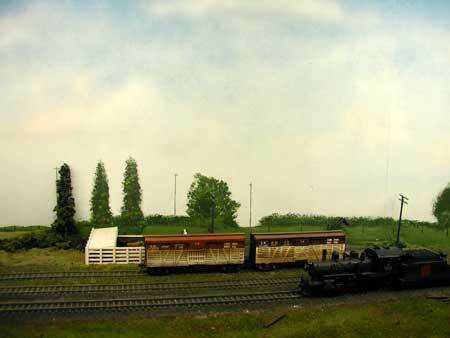 Painted backdrop, foreground trees and the track passing on a scratchbuilt wooden trestle. Perfect. 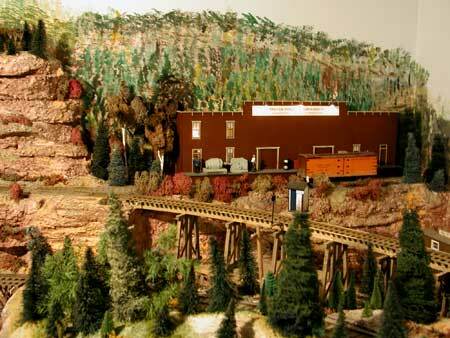 This scene of cliffs and rocks reminds me of the work of pioneer model railroader, John Allen. Coal and water service for the steam locomotives is a must. 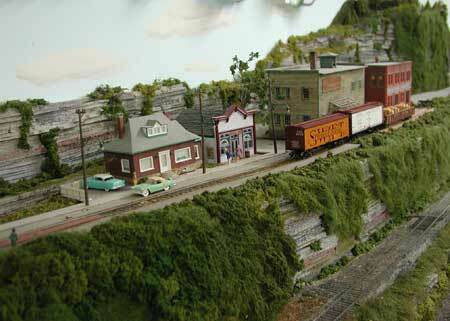 This is a good lineside industry that doesn't use up a lot of real estate. 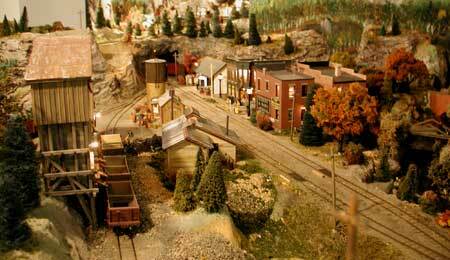 A mine is an industry that can generate a lot of rail traffic. This is a small operation with lots of potential. 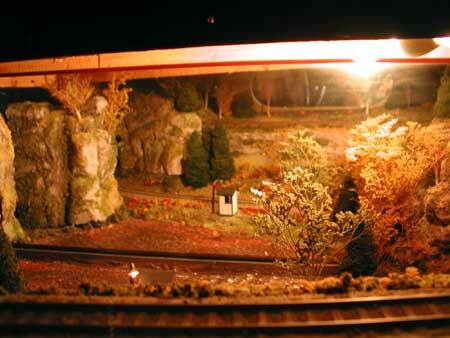 Looking into the window box diorama. This provides access and creates a memorable scene. A terrific rail fanning spot! 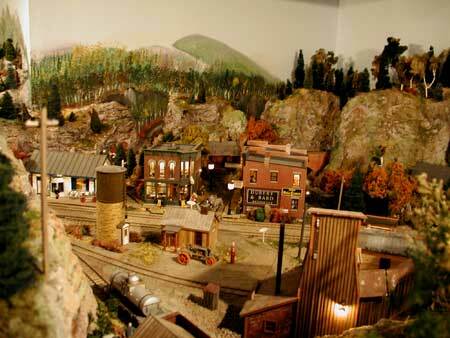 There's a lot of detail in this small "western" town. 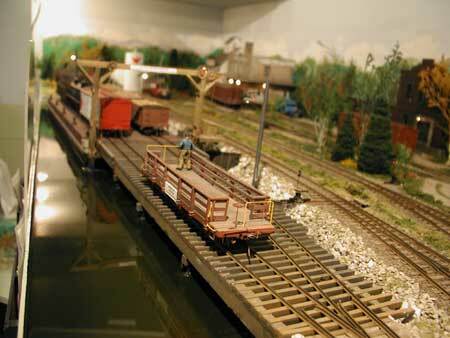 Our journey through model railroad photos on the CARM layout tour ends here. Bob Sparkes, a fellow member of our CARM Central Ontario Chapter, gave me some photos he took at the convention. Our group is setting up the small display layout. That's former president, Bill Bradford, on the right. Bob took the following photos in the contest room. 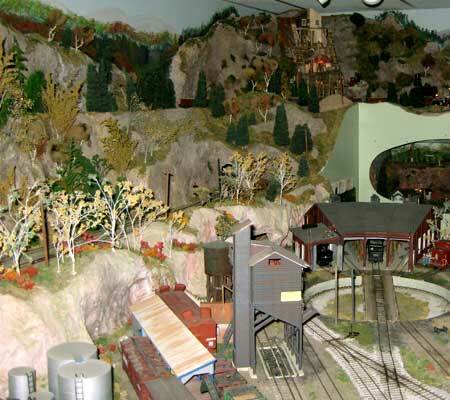 There were some excellent entries among which is Bill Bradford's GO train and information on the reinstated line to Toronto from Barrie, Ontario. 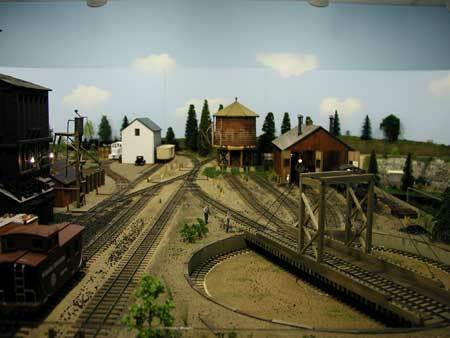 The pictures below that Bob took are from other layouts on the Hamilton tour. 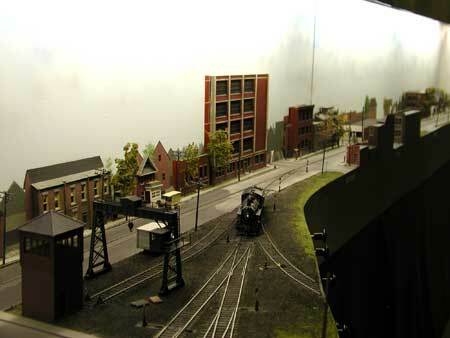 The first several are of a trolley layout. 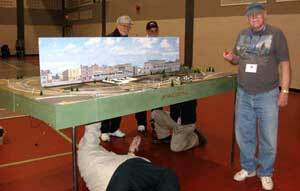 I'll keep adding model railroad photos from other layout tours and conventions. They'll be listed on the "Train Photos Overview" page. 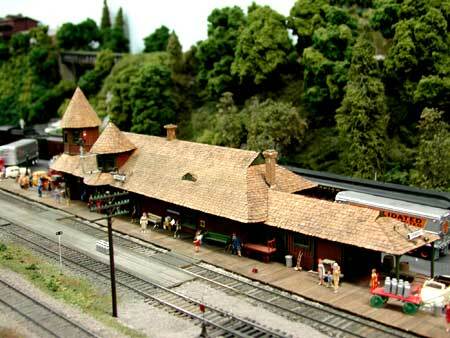 Return from "model-railroad-photos" to the Train Photos overview. 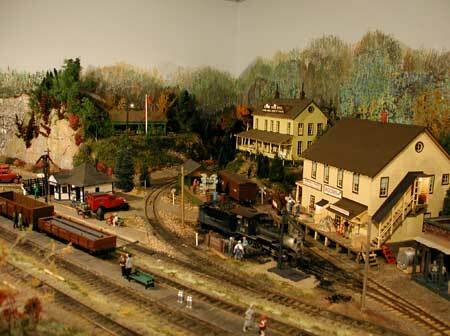 Return from "model-railroad-photos" to my Home Page.